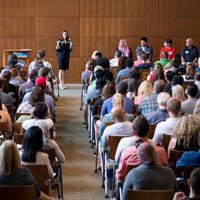 Webster University hosted over 150 new graduate students and their guests on Saturday, Aug. 13, for orientation. As part of the morning, students heard from President Elizabeth (Beth) J. Stroble, Provost Julian Schuster and Vice Provost Nancy Hellerud. After the welcome from leadership, the students heard a message of how to be successful from Beth Russell, assistant provost, as well as a student panel of graduate students moderated by Kyle McCool, director of Graduate Advising. The main presentation was followed with concurrent sessions on topics ranging from financing their degree, writing and research, making their degree work, taking it online and partnering for success. The morning ended with a visit from the Gorlok, Webster University's mascot, and tours of the home campus.